Angela Walters and Jennifer Keltner provide helpful tips on when and how to use rulers with machine quilting. 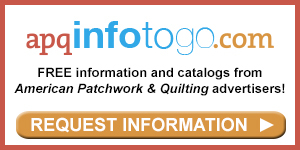 Hi, I'm Jennifer, here at the American Patchwork & Quilting sewing studio with Handi Quilter ambassador Angela Walters. We're talking about ruler work. And ruler work, Angela, as I understand it, is really more about working on the long-arm machine. On a mid-range or home sewing machine, they would have guides that you can use on the bed of your machine. 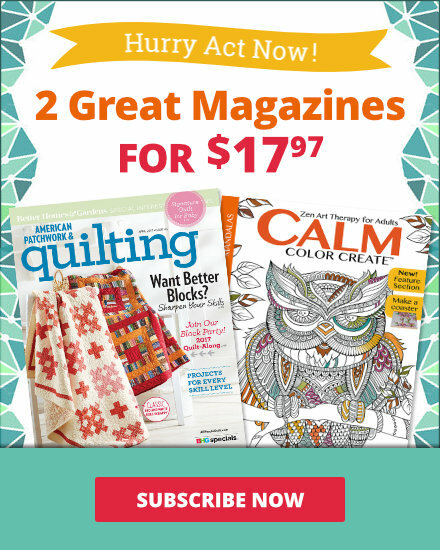 But when you're working on a long arm, you don't really have those spaces, but you need to make straight lines sometimes in your quilting, so you're going to share with us the tips for that." "Yes. Well, a long-arm machine runs with two sets of wheels: one's running this way, so getting those straight lines is a little tricky. It definitely comes down to practice. I remember the first time that I stared quilting straight lines and it looked so bad that my husband told me I should stick to allover quilting designs. So, being the wife I am, I took that as a personal challenge. Now I like quilting straight lines." "Game on." "It's really not as hard as it looks." "Alright. Well, we've got a sample here. How long of a line do you normally have to be sewing before you want to use a ruler?" "Well, normally I don't like to use rulers, especially for shorter lines, but anytime I'm working within a seam (like stitching in the ditch) or if I'm quilting a line that's longer than 6" or so, I'll definitely pull out the ruler since it gets a little tricky keeping it straight." "Right. You do have to have a steady hand if you're doing it freehand, but there are some tools you can use." "Yes. Let me show you what will help your ruler quilting. First, let's talk about the kind of ruler you would use. A long-arm quilting ruler isn't the same as a rotary cutting ruler or anything like that. You actually have a thicker ruler. It's usually about a quarter-inch thick. And what that does is it keeps the hopping foot on the long arm from actually hopping over and breaking the ruler. This is a good size to use (this is the one that I usually use). It's 2x12". It's very versatile and works in a lot of different ways." "And it's manageable in the space you have on the machine bed." "You can find a number of different kinds of templates and rulers out there. I mean, the choices are just overwhelming. Another thing that will help is this handy do-dad here. This is an extended base place. And this actually hooks on to the bottom of the machine. And what it does is provide a flat surface. If you imagine that your quilt is over it, it helps to give you a flat surface to really keep your ruler steady. So this would come with whatever machine you had." "Right, because there is a little bit of play in the bed of the machine because it's held up with the tension of the roller." "Exactly, it's not super stable. I would only use an extended base plate if most of your quilt is straight-line quilting, because once you start getting into the free-motion quilting, it does add a little bit of a drag, so you kind of need to weigh whether this will be beneficial or not. I actually don't use one too incredible often, because I've just learned how to do it without it, but if you're struggling, this is definitely the way to go." "Or a great place for beginners who are just starting to work with rulers. I sometimes say that it's kind of like chewing gum and riding a bike -- at first, you have to do one or the other, but once you get the hang of it, you can get into the swing of things." "Well, another important thing is how to hold it. That is probably the most important thing. The way to hold it is not to have a death grip on it." "Right, the death grip where you have your fingers all tensed up." "Or your hand is contorted and you're hurting by the time you're done. Instead, you just want to have a nice, light grip. I'm going to start quilting now. I just want to demonstrate how you might hold it. If you think of it, instead of using it as something still that you're pushing your machine against, it's more of a guide. It's just kind of there to keep your machine from going over there. So a nice, light hold and a smooth movement. Now if you get too much down here and you push down, well what happens is that goes up, and the line isn't straight, and what can happen is you can actually jump over that and break your ruler." "I have Exhibit A here." "Yes, this is my old ruler, and you can tell it has some war wounds, of course, and that's from not holding it properly. And nothing will scare you faster than breaking your needle and your ruler, and all the stuff that goes with that. The nice, light hold, and just being careful with that will keep you out of trouble." "So even the professionals had a learning curve. Remember that." "Absolutely. And this is not an old ruler, so this has been around. I still make mistakes from time to time. 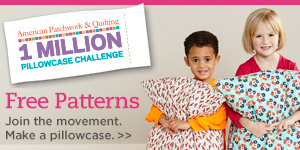 So, let's quilt a couple lines and I'll show you a little bit about that." "Terrific." "Again, whether you're stitching in the ditch or stitching straight lines, I feel like everyone has their on days and their off days, you know, days where they're doing better. If it's not really working, then you're probably stressing out too much, so just relax and have fun with it. So I'm just going to hold it gently. Now since I'm going to do a horizontal line, I'm going to hold it in front of the machine. I don't usually hold it back there like that, because it's just kind of a weird arm angle to be in. Keeping it in front will just help keep it a little bit more stable." "And if you were sewing a vertical line, I noticed that you had it behind the foot. Is that normally where you would keep it?" "Yes. I'll show you that actually. So, I'm just going to hold it still and follow along. Again, I'm not clenching, I'm not distorting the quilt -- it's more there as a guide. And I'm also going to make sure that I'm moving the ruler as I go. I don't want to be holding down the end of it and having this part come up." "Now, do some people mark on their quilt tops?" "Yes, if you're quilting long straight lines like cross-hatching across the whole quilt, you probably would want to mark that because once you start going, it's hard to keep that parallel line going." "And because you can't see the entire quilt top when you're working on a long arm, (cross-hatching especially where you have really long diagonal lines) is a great place to use a combination of rulers and marking." "Yes, but if you're stitching in the ditch or just doing shorter lines, then marking is not so necessary. And again, like we talked about, if you're doing a vertical line, just hold your hand there and run it along like that. Now what I'll do is actually stop, reposition the ruler, and continue on. I find that it's kind of hard to reposition the ruler and keep quilting, and then next thing you know, I've quilted over my finger, so I try to stop. If you have a stitch regulator this is a good place to maybe consider using it, because it will allow you to get the hang of the ruler before you move along." 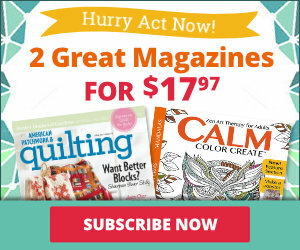 "Thanks for sharing those tips for straight-line quilting and ruler work, Angela. Ruler work is a little more effort, but adding that to your machine-quilting techniques that you've mastered is definitely worth the effort. So spend some time practicing your ruler work today and enjoy your quilting time.